Volleyball finished a sweep over the weekend, defeating George Mason 3-0 Oct.12 and George Washington 3-1 Sunday afternoon. The Rams (12-7, 7-0 Atlantic 10 Conference) extended their conference winning streak to 23 matches and their overall season winning streak to eight. Sunday’s match provided additional significance with the presence of three-time Olympic gold medalist Misty May-Treanor. The announced attendance of 1,134 was the largest home crowd in more than nine years. 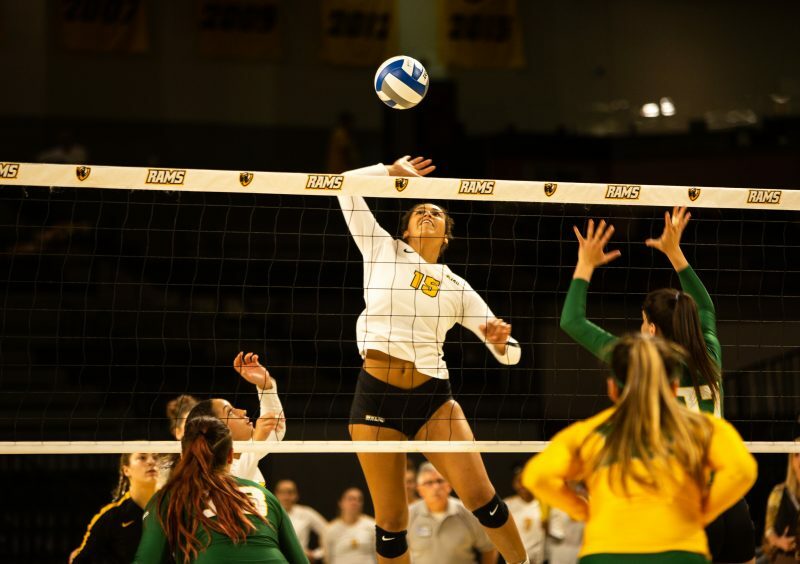 VCU brushed off a slow start to the match and despite an uncharacteristic number of service errors, defeated GW 3-1 at the Siegel Center Oct.14. The teams started the match trading service errors before GW (8-11, 2-4) took a 7-4 lead in the first set. 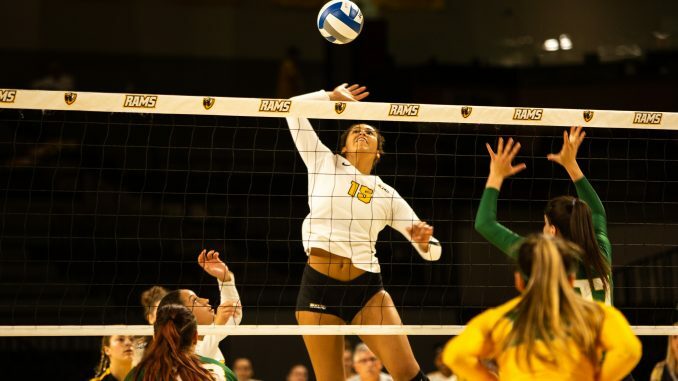 VCU took the set lead for good after a six-point run that started after a kill and block from junior outside hitter Vicky Giommarini and a kill from junior middle blocker Jasmin Sneed. Junior opposite hitter Gina Tuzzolo proved instrumental in the later stages of the first set with a key block to extend the first set lead to 16-11. She also added three of the Rams’ final four points to win the set. VCU started the second set in a 4-1 hole before battling back and taking the lead aided by a key block from senior middle blocker Tori Baldwin. On the next rotation, Sneed followed Baldwin’s lead with a block of her own. The successive pair of blocks sparked an extended VCU run that flipped the second set score from 7-7 to 22-12. VCU dominated the net all afternoon as four players recorded at least five blocks — Sneed led the way with nine. For the match, the Rams out-blocked the Colonials 16-5 and held them to a .007 hitting percentage while forcing 36 attack errors. Tuzzolo led the offensive attack with 10 kills and is the fourth Ram in consecutive matches to lead in kills. Volleyball continued to roll Friday night, defeating George Mason 3-0 at the Siegel Center. The victory extended VCU’s conference winning streak to 22 matches and its overall season winning streak to seven. The Rams (11-7, 6-0 Atlantic 10 Conference) received an early spark after an emphatic kill by Baldwin and a key block by Sneed. VCU jumped out to a quick 7-3 lead over GMU (6-10, 4-2). During the first set, the Rams had three different runs of at least four points and three different players recorded at least two kills. The second set was a back-and-forth affair, with VCU never leading by more than two points, until a block by Sneed — VCU’s first for the set — extended the set lead to 15-12. After trading a few more points, VCU ended the set on a 7-1 run with six points coming off of serves from junior setter Dajah Ard. During the second set alone, VCU forced GMU into 13 unforced errors and 31 errors in total for the match. VCU picked up the third set where it left off in the second, starting with a 7-1 run and never looked back. During the run, Tuzzolo sparked the team by chasing down an errant pass out of bounds to get the ball back in play as Baldwin finished off with the kill. The Rams take their act on the road next weekend with matches against the Rhode Island Oct. 19 and Fordham Oct. 21.